At shortly before 13:30 today in northern Alaska there was a large earthquake, with a magnitude of M=7.1. Many of us are familiar with the Good Friday earthquake, a megathrust subduction zone earthquake. This earthquake has a birthday tomorrow, from 27 March, 1964 (55 years ago). The M=9.2 1964 temblor created a tsunami that traveled across the Pacific Ocean. More about the Good Friday earthquake and tsunami can be found here. Alaska has a variety of major fault systems in addition to the subduction zone. There are also large strike-slip faults (move side by side) such as the Denali fault and the Kaltag fault. 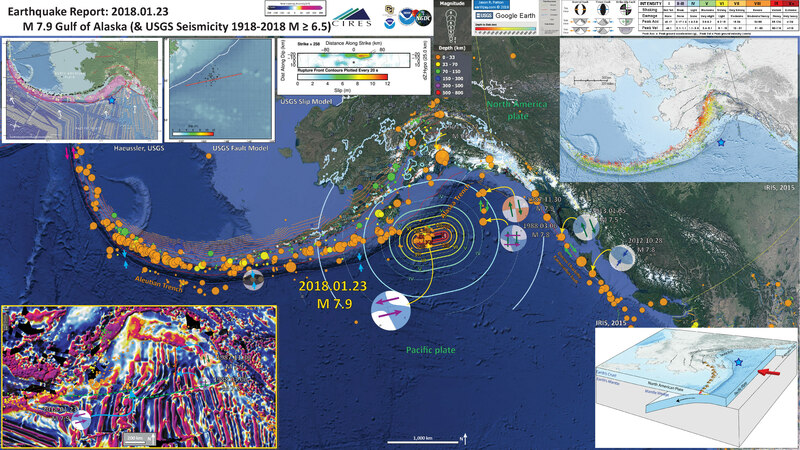 There are even more strike slip systems too, like the Queen Charlotte / Fairweather fault in southeastern Alaska and the Bering-Kresla shear zone in the extreme western part of the Aleutian Islands. Alaska is so cool, they even have extensional (normal) earthquakes, such as on 1 December 2018. 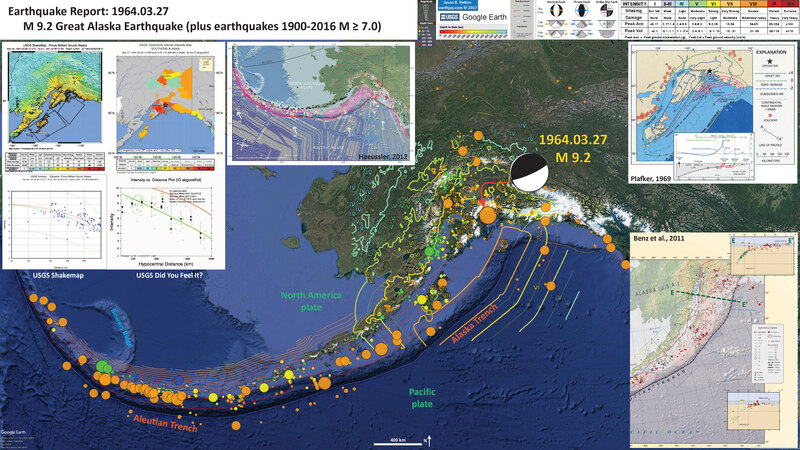 Recently, there was a series of strike-slip earthquakes in the Gulf of Alaska probably related to reactivation of pre-existing structures in the Pacific plate. We continue to have aftershocks in this area. Also, there is an ongoing sequence of earthquakes (now, maybe it is a swarm?) in northeastern Alaska. The largest quake was in August last year (2018), with a magnitude of M=6.3. Today’s earthquake happened away from one of the mapped faults in the USGS Quaternary Active Fault and Fold Database (the Kaltag fault). The earthquake mechanism shows this earthquake may have been a slightly oblique normal type of an earthquake. I placed strike-slip arrows on the 2 possible nodal planes.but this is mainly a normal earthquake. There was also a normal earthquake in 1958, when a M=7.1 quake struck about 50 km (35 miles) to the southeast of today’s quake. However, the 1958 event was oriented perpendicular to today’s quake. Below are some observations made following the 1958 earthquake. There was evidence of liquefaction, with sand volcanoes about a meter thick extending for hundreds of meters laterally. I need to get to bed, but will try to write more tomorrow. I plot the seismicity from the past month, with color representing depth and diameter representing magnitude (see legend). I include earthquake epicenters from 1918-2018 with magnitudes M ≥ 3.0 in one version. I include the slab 2.0 contours plotted (Hayes, 2018), which are contours that represent the depth to the subduction zone fault. These are mostly based upon seismicity. The depths of the earthquakes have considerable error and do not all occur along the subduction zone faults, so these slab contours are simply the best estimate for the location of the fault. We can see the trends of these red and blue stripes. These lines are parallel to the ocean spreading ridges from where they were formed. 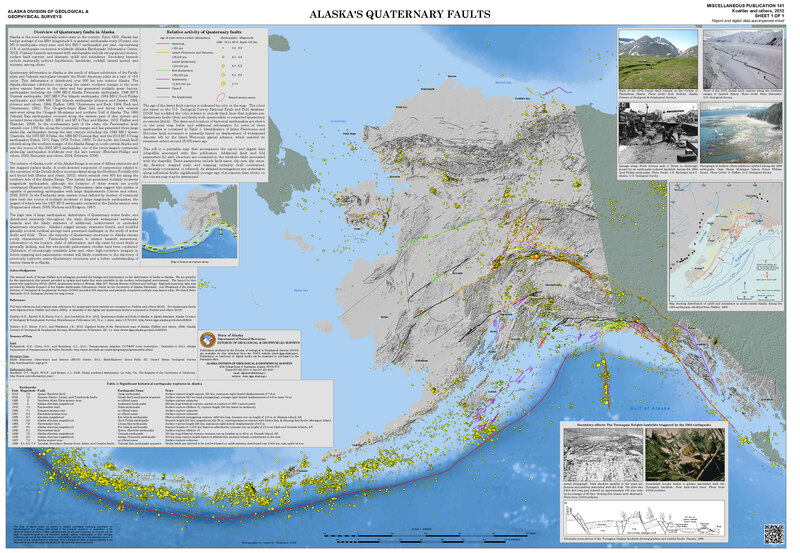 In the lower left corner is a map from the USGS that shows the major fault systems and historic earthquakes in Alaska. Note the large area in pink from the 1964 Good Friday earthquake. 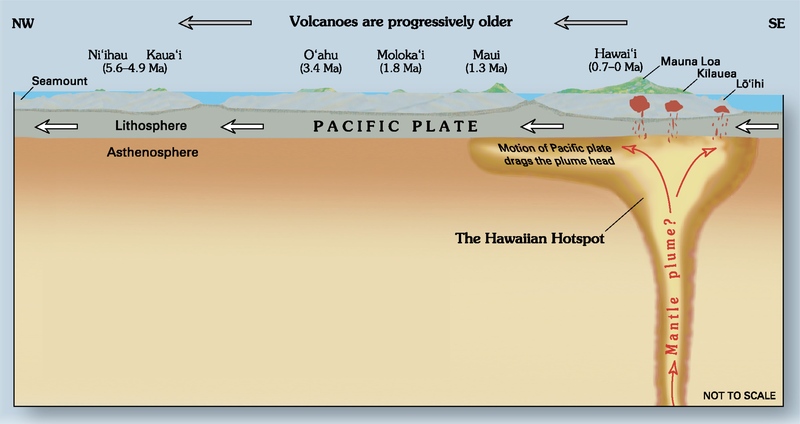 In the upper right corner is a low angle oblique figure showing the subduction zone (see the Pacific plate subduct beneath the North America plate). Some of the strike-slip faults are shown, including the location of the 2002 Denali earthquake sequence. This is from USGS Fact Sheet fs014-03 (USGS, 2003). I placed a blue star in the general location of today’s M=5.2. In the upper left corner is a map from Fletcher and Christensen (1966). In their paper, they describe a sequence of earthquakes in the 1950s. I placed a blue star in the general location of today’s M=5.2. Here is a poster that shows the details of the northeast Alaska sequence that started in late 2018. Here is my report that provides more details about the poster. 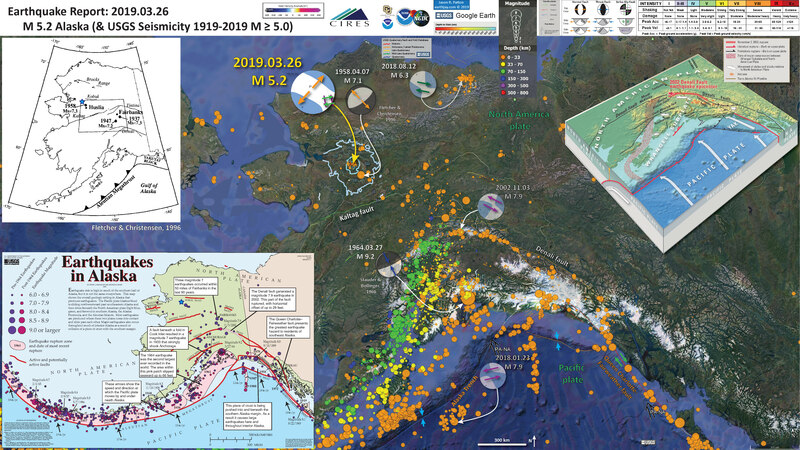 Hree is the poster from the Gulf of Alaska earthquake in January 2018 and this is an update report page for this sequence. In commemoration of the 55th anniversary of the Good Friday earthquake and tsunami, below is the poster from my report here. Davis (1960) includes some fantastic photo records, which some are shown below. Here is a great map showing their observations following the earthquake. Below the map is the legend and caption. Map of a portion of the field epicenter. Alaska earthquake of 7 April 1958. (Compiled from vertical air photos and USGS Alaska Topographic Series 1:63,360, Melozitna and Kateel River Quadrangles, 1954. Here is the map from Davis (1960) that shows their estimate of the ground shaking intensity (using the MMI scale as described above). Isoseismal map of the intensities of the April 7, 1958 earthquake, (Modified Mercalli scale). Here is a photo of one of the sand blows from Davis (1960). Surface of one of the major sand flows covering an area greater than 1 square mile. The silty sand has a relatively uniform thickness of approximately 2½ feet. There was a lake in the middle of some sand dune deposits, which were overlying alluvial (river lain) sediments. Below is a photo showing some of the landsliding in the sediments and below the photo is a cross section drawing. Note the large spatial extent of this slope failure. A conical collapse nearly 20 feet deep. It occurred approximately 200 yards from the nearest sand flow. Here is a map from Michael West at the Alaska Earthquake Center. This shows today’s earthquake in reference to the Quaternary faults and folds in Alaska: A digital database (Koehler et al., 2012). Dr. Rick Koehler is currently at the University of Nevada Reno and The Nevada Bureau of Mines and Geology. This is the map poster from Koehler et al. (2012). The link is to a 63 MB pdf file. Here is a great tweet that discusses the different parts of a seismogram and how the internal structures of the Earth help control seismic waves as they propagate in the Earth. Frisch, W., Meschede, M., Blakey, R., 2011. 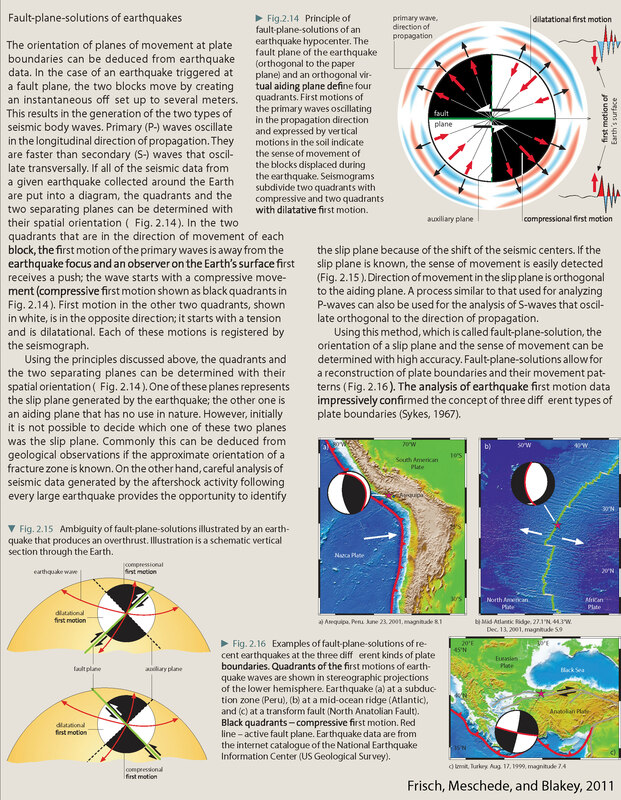 Plate Tectonics, Springer-Verlag, London, 213 pp.